St Mary the Virgin, the Parish Church of Harmondsworth, dates from the 12th -15th Centuries, with the oldest parts being the South aisle, with massive Norman columns, and the entrance. 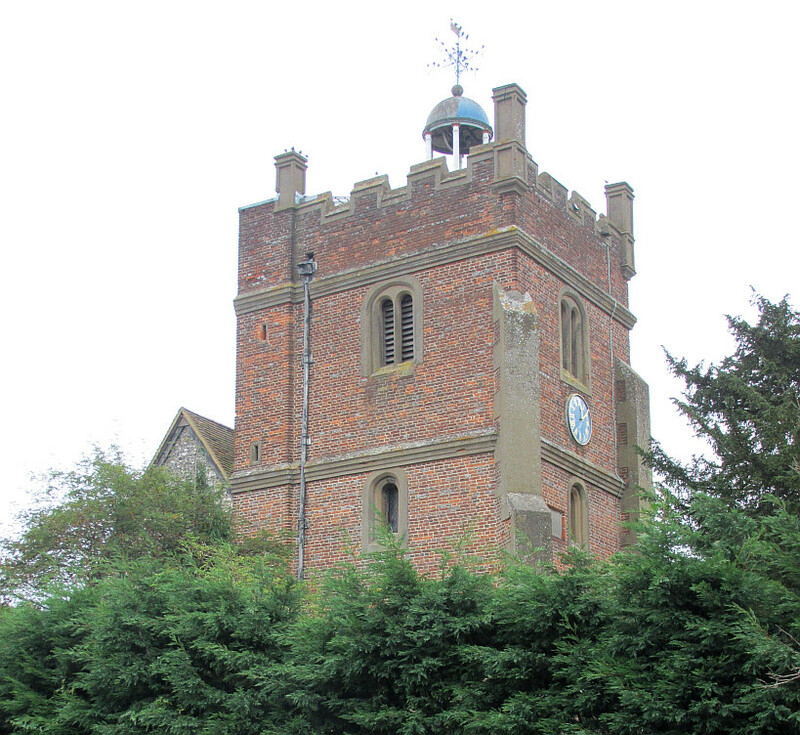 According to the Royal Commission on Historic Monuments, the North aisle is 13th Century, the North Chapel probably 14th Century, and there was remodelling of the chancel in the 15th Century, with the tower built in 1500. The Nave is of mixed date, as would be expected with everything on all sides being built and rebuilt, with parts from the 13th Century onwards. The 19th Century saw a restoration and addition of the porch and vestry. From the exterior, the closely set trees make it difficult to see the Church as a whole, and the enduring image is of the blocky, square tower, brick built with a little cupola on top bearing the weather vane (pictures above), rather than the flint and stonework body of the Church. 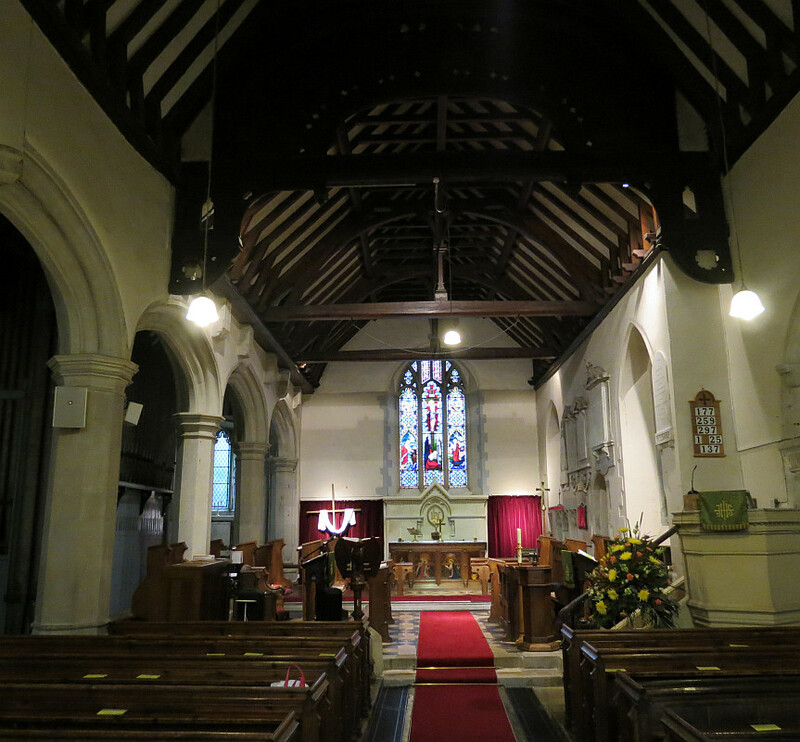 The Church is situated in the southern part of Hillingdon, Middlesex, a 20 minute stroll from West Drayton, and about five miles south of Uxbridge. Rather too close to Heathrow for comfort, much of the Parish could be obliterated if the airport expands. The Church has an evocative interior, with open, beamed roof to the nave of the 15th Century, and narrow aisles separated from the nave by arches of differing dates, and the layout and furnishings appear to be the same as they were 100 years ago, when the Royal Commission on Historic Monuments did their survey. 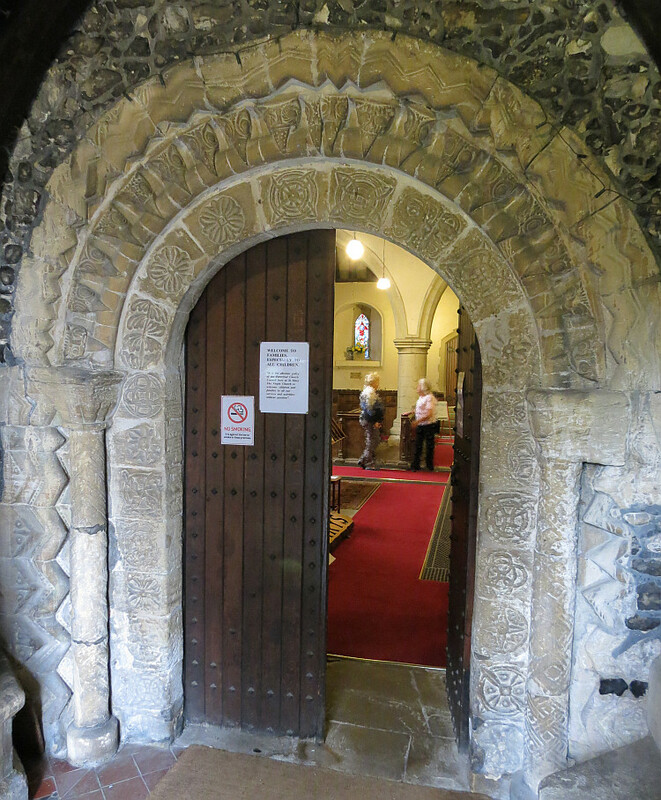 The entrance, which has been moved, is an exquisite Norman doorway, 12th Century, with what intriguingly look more like Saxon carvings all the way round, perhaps by Saxon craftsmen working in the style they knew for their new masters, surrounded by conventional Norman chevrons (zig zags). The relief carvings include concentric circles and other simple geometric shapes on the innermost border with around them what appear to be stylised bird’s heads with sharp beaks. 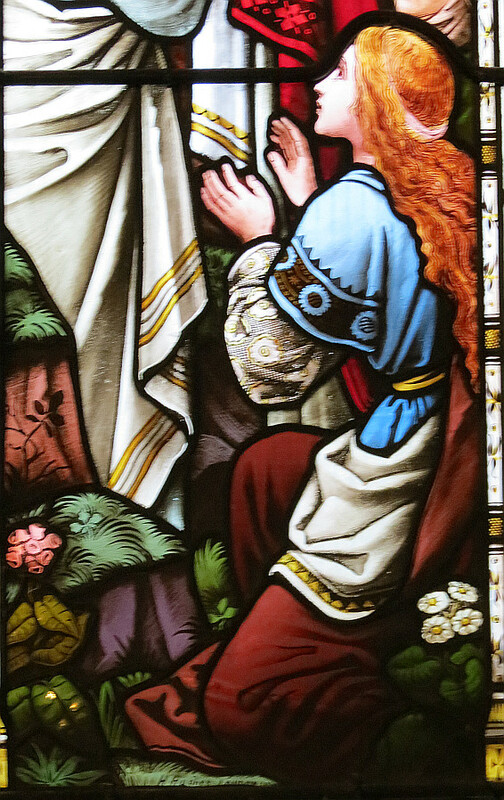 The porch, a 19th Century addition in keeping with the Church, has been set with modern stained glass echoing the designs from this doorway, an inspired thought. Harmondsworth Church has a modest number of monuments, nothing with sculptured figures, but at least a couple of winged cherub heads, and a few fairly grand architectural wall monuments, including two obelisk monuments. 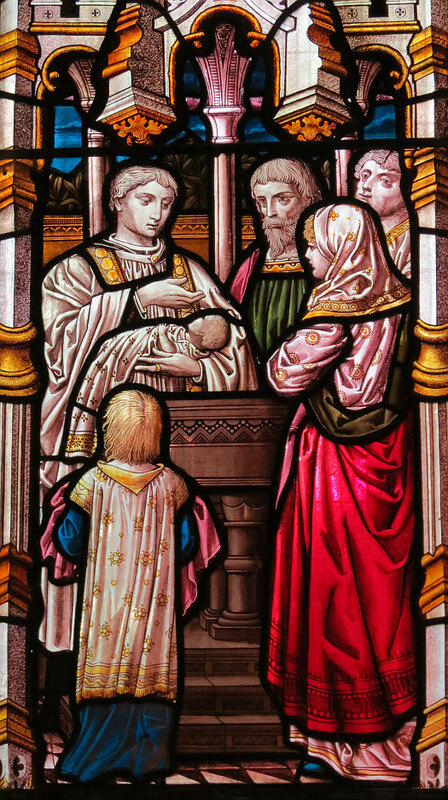 Two others of the monuments are by a Middlesex firm of sculptor masons, Burgiss of Uxbridge, and along with the several Classical monuments, and plain black and white ones from the early 19th Century, there is an example of a Victorian Gothic panel. Monument to Revd. John Bush, d.1713, Classical . Revd. 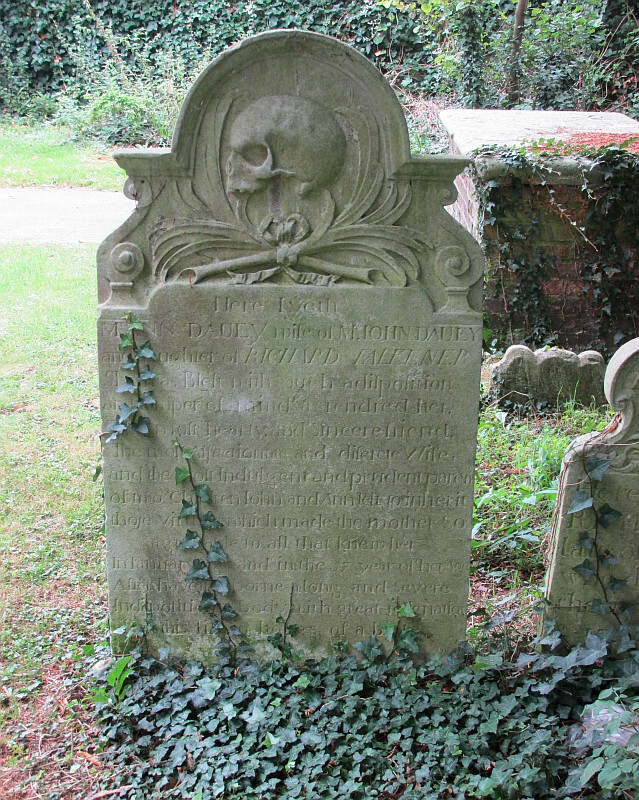 John Bush , d.1713, and relatives through to 1756. He was Vicar of the parish. Erected by 'the Kinswoman and Executrix to his son Charles Bush, Jane Johnson of Windsor'. 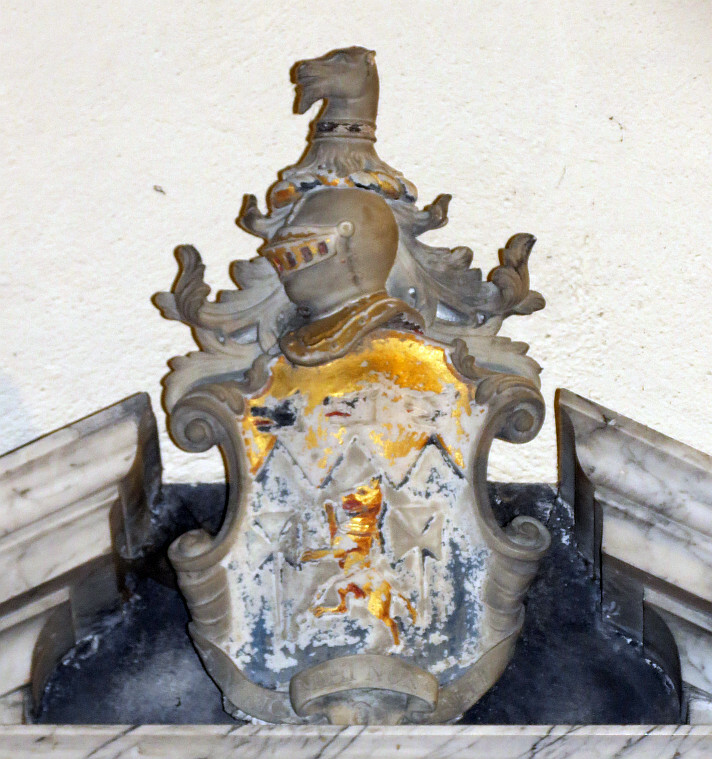 In white marble with black streaks, Classical, with recessed sides, pediment broken at the top to admit a coat of arms, and at the base, generously sized apron and two carved brackets. 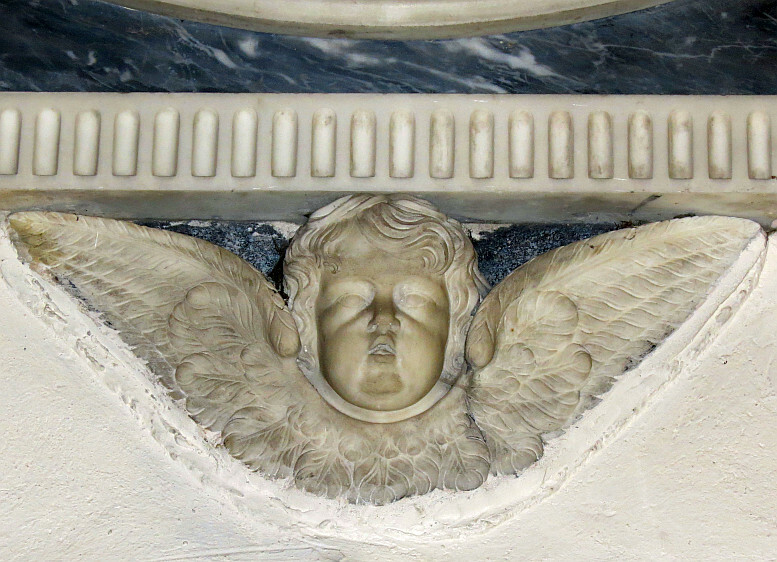 Monument to Anna Bankes, d.1734/5, and carved cherub head from Richard Bankes monument . 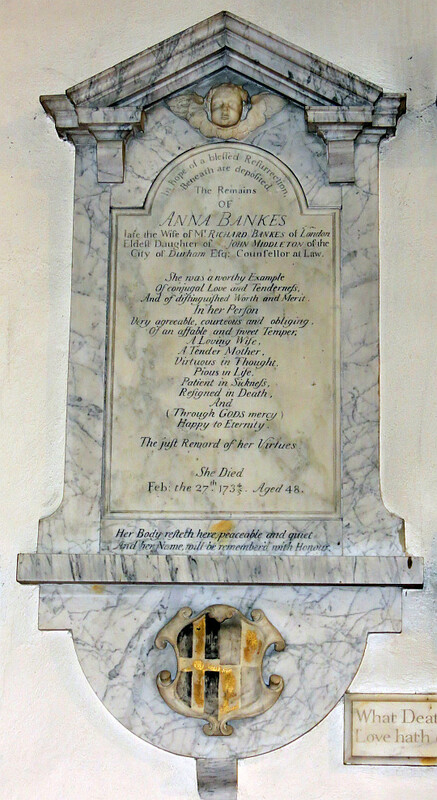 Anna Bankes , d.1734/5, with the inscription and eulogy in crisp script, on a panel with a semicircular top, on which is a carved winged cherub head within an open pediment. At the base, a shelf under which is a curved apron bearing a scrolly cartouche upon which is painted a coat of arms. All in black and white marble. 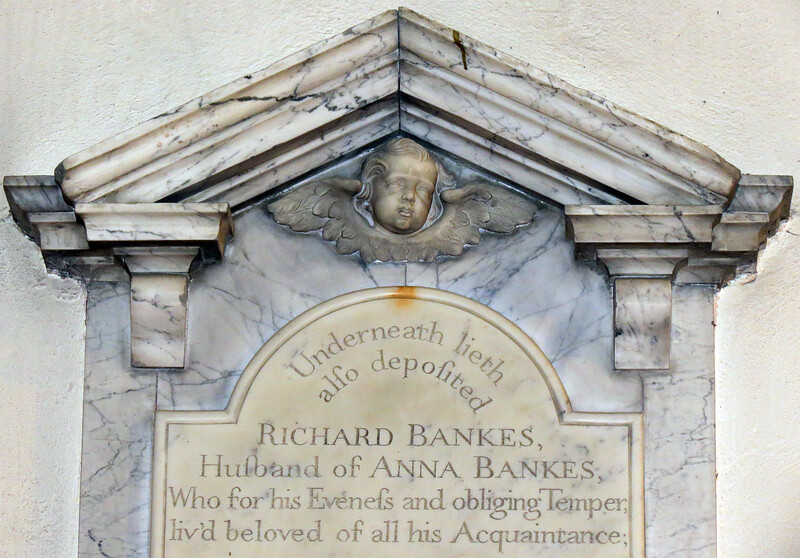 Next to it is the identical panel to her husband, Richard Bankes , d.1750, and in between at the bottom is a small separate panel with the motto ‘What Death divided, Love hath conjoyned’. Willing and Stirling obelisk monument, 1770s . Thomas Willing , d.1773, and Sir Walter Stirling of Faskine in Scotland, d.1786. An obelisk monument, with the obelisk occupying about half the height of the monument, and bearing a simple pot. This rests on a prominent shelf, beneath which is the oval inscribed panel on a rectangular backing, which like the obelisk is in dark and light grey marble. Beneath this, a narrower shelf, under which is a cherub head with spread wings, and two brackets. 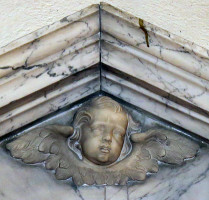 Winged cherub heads are innumerable in British churches, and also in architectural sculpture, and several examples of the latter may be seen on the cherubs page on this site. Revd. 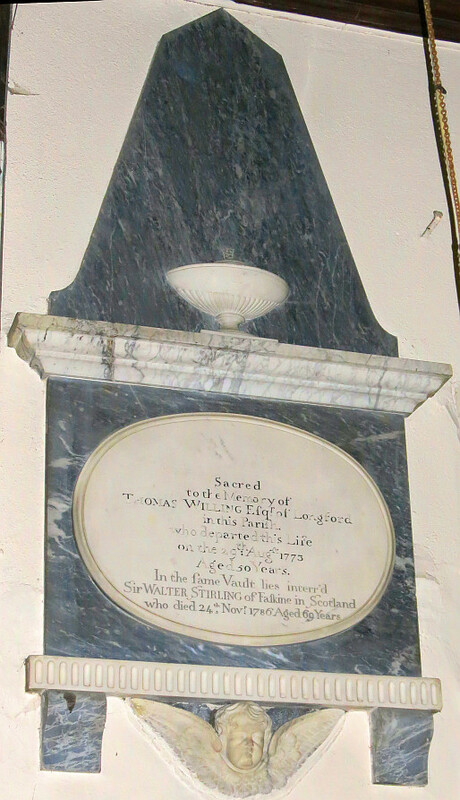 John Lidgould , Vicar, and wife Honoria , and Thomas Sedgwick of Hackney, who married Marian Lidgould , the daughter of the Vicar, who placed the tablet in 1787; an additional line notes her death in 1810. Plain panel with upper shelf and black backing. 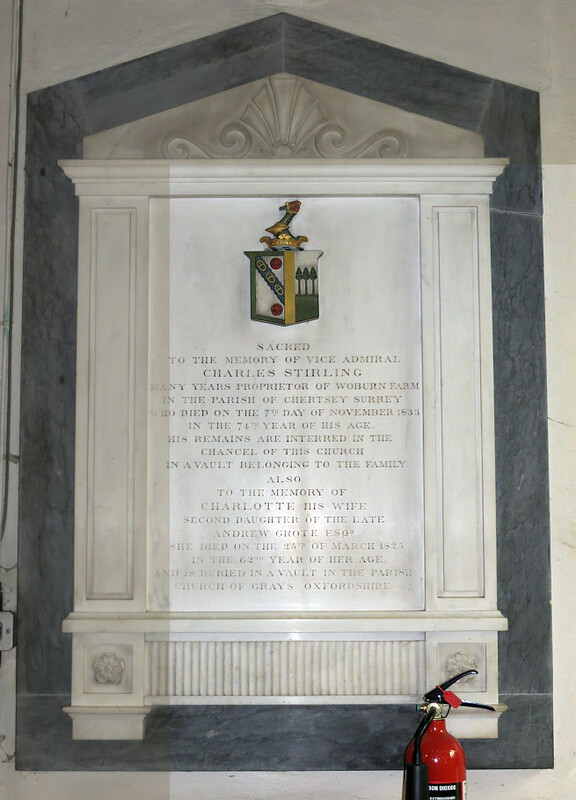 Monuments to the Stirlings, 1800s-1830s, typical black and white monuments of the period . 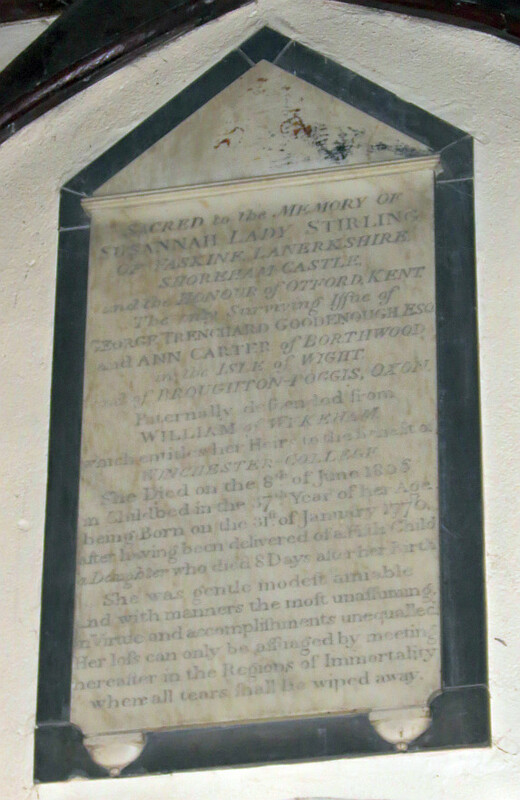 Susannah, Lady Stirling , d.1806, with a long inscription (noting among other things that she was descended from William of Wykeham, Chancellor of England, Bishop of Winchester, and founder of New College in Oxford), completely filling a panel with a narrow shelf above and triangle rather than pediment above, little rounded feet below, on a black backing. Langhorne children , d.1807, all three dying of the malignant scarlet fever. They were the children of J. T. Langhorne, Vicar, and his wife Garthside. White panel with upper and lower shelves, plain, and lid, and narrow black backing. 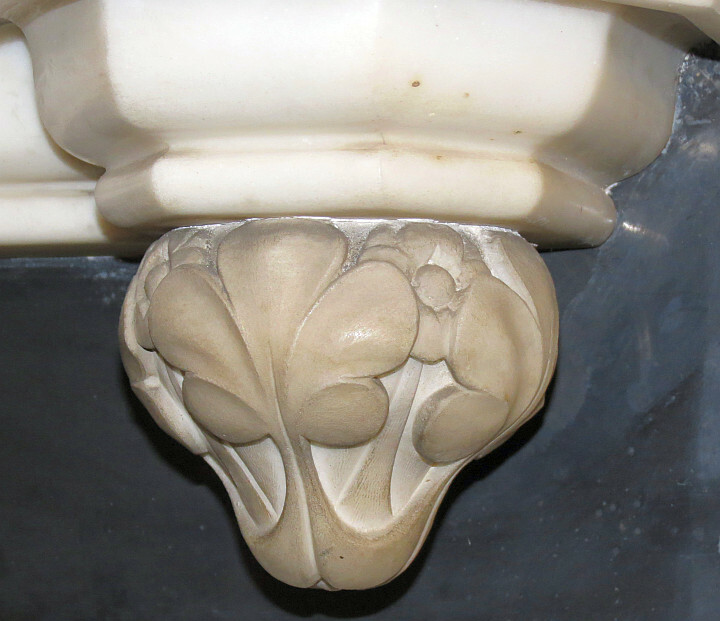 Two moulded brackets below. 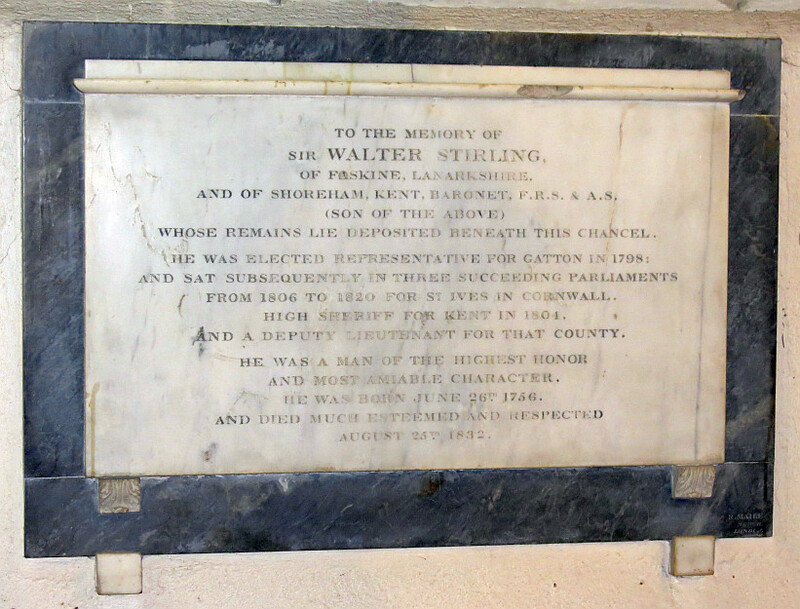 Sir Walter Stirling of Faskine, Lanarkshire, and of Shoreham, Kent, Baronet, d.1832, the son, a plain panel with thin shelf on a dark backing. Signed by R. Maile, an obscure New Road mason sculptor - the New Road, now Euston Road and its continuations in both directions, housed many mason sculptors in the early decades of the 19th Century. 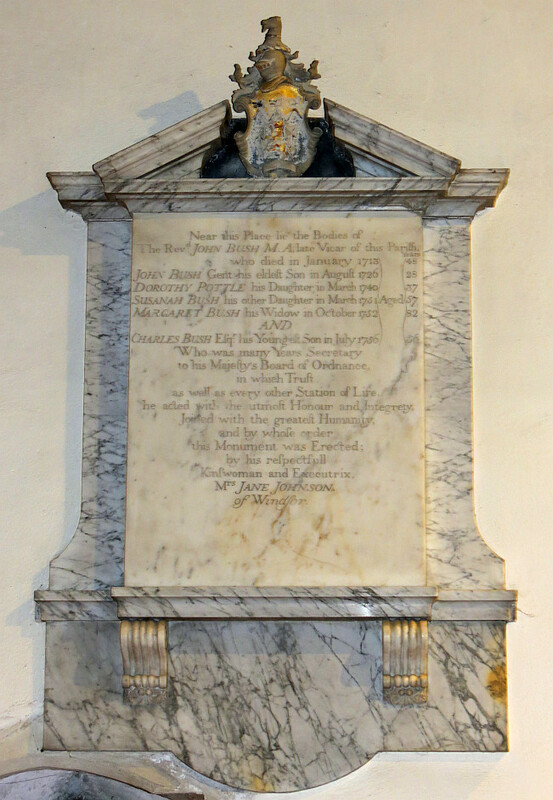 John Burgiss of Uxbridge's monument to Elizabeth Tillyer, d.1827 . 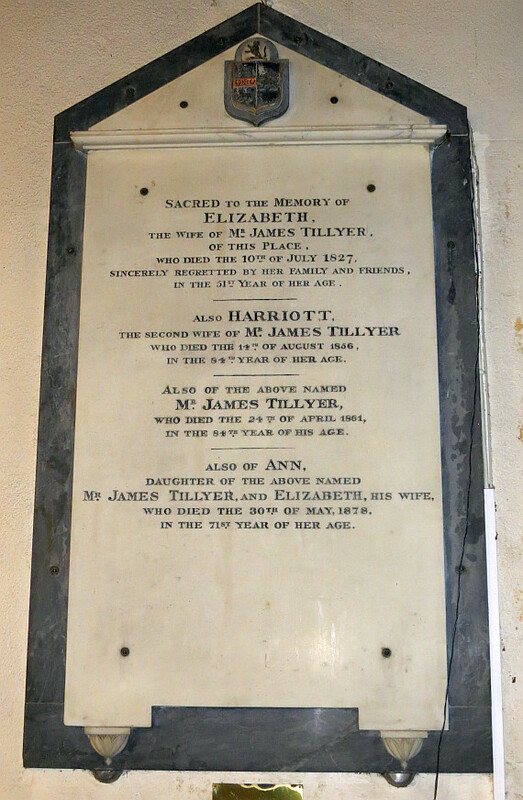 Elizabeth Tillyer , d.1827, Harriott Tillyer , d.1756, the first and second wives of James Tillyer , d.1861, and daughter Ann Tillyer , d.1878. 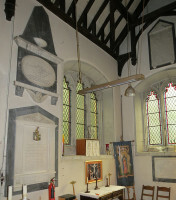 A tall white panel with narrow upper shelf and borderless pediment, a triangle rather (the design perhaps following the Lady Stirling monument noted above), on which is a coat of arms. There are prominent holes where the monument is screwed together. 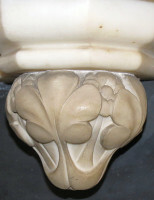 At the base, two small corbels, nicely carved with leaf designs. 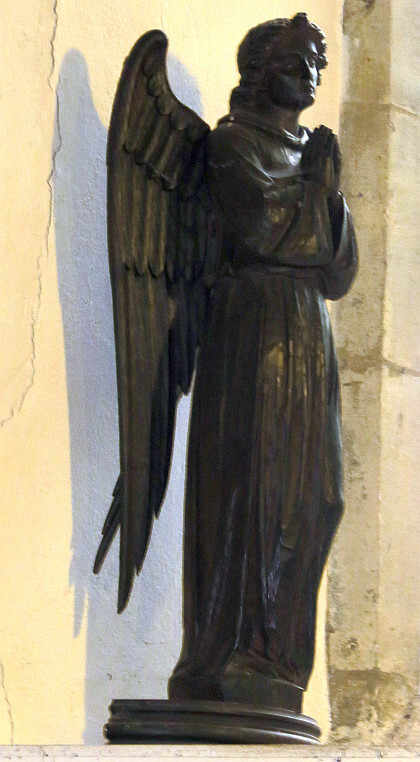 All on a narrow, dark backing, and signed by Burgiss, from the firm of mason sculptors based in Uxbridge. Presuming this was put up for Elizabeth Tillyer, this would be John Burgiss, the father. 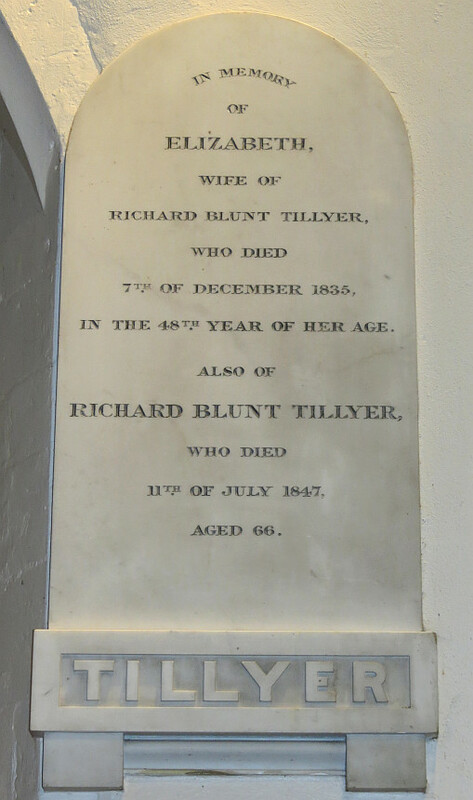 Another Elizabeth Tillyer , d.1835, and husband Richard Blunt Tillyer , d.1847, on an oval topped marble panel with a thick base inscribed ‘TILLYER’, two blocky supports below - see picture at top of page. 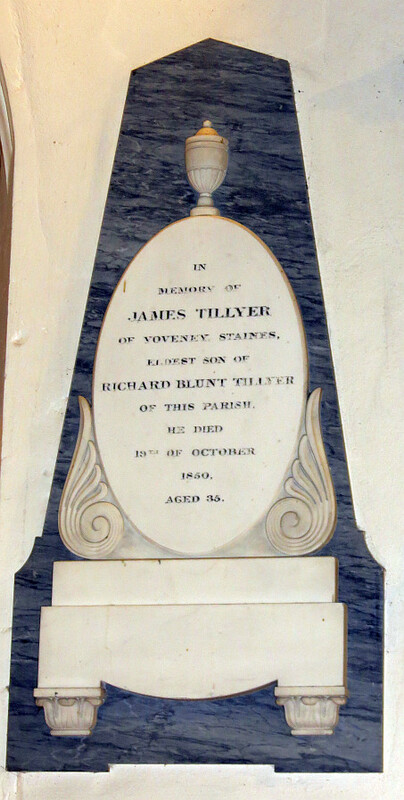 Late obelisk monument to James Tillyer, d.1850 . James Tillyer , d. 1850, another obelisk monument, with unusually, the obelisk and the backing of the lower portion of the monument as one connected mass of streaky black and grey marble: it is this which is the clue that the monument is far later than the usual date for obelisk monuments. The inscription is on a large oval of white marble, occupying over half the height of the monument, roughly central, supported by two curly, carved side pieces, and resting on a heavy plinth with carved feet looking rather like capitals from pillars. At the top is a small Grecian pot, without handles. 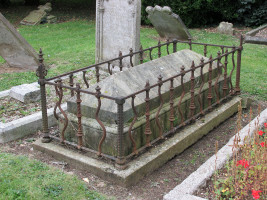 Charles Stirling , d.1833, and wife Charlotte , d.1825, with plain side pilasters, upper and lower shelf, pediment above without edging, bearing a shell and two scrolls, and below the lower shelf, a strange grid with simply carved flowers to the sides, all on a black backing. The painted coat of arms is on the inscribed panel rather than on the pediment (see picture above, with other Stirling monuments). Walter Vavasour , conventional black and white monument of the 1820s-30s, but undated, as a tomb chest end with upper shelf, lid, and small feet, on a black backing; a separate plain panel to his wife, Charlotte Vavasour , has been attached underneath, also undated. The upper monument is signed by E. Burgiss, the son of John Burgiss noted above. Victorian Gothic monument to Eleanor Smith, d.1873, and details of corbel and pillar capital . 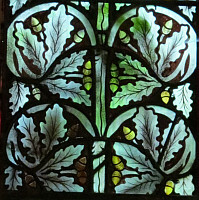 Eleanor Smith , d.1873, styled as a Gothic window, with trefoil top, clustered pillars at the sides with carved leafy capitals, and with repeating leaves and flowers over the top. 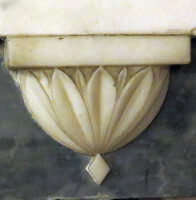 At the base is a moulded shelf, and beneath the pillars, corbels carved with clustered leaves. On a black shaped backing. Elegant. 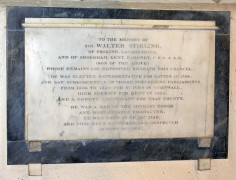 The monument is signed by Burke and Co, 144 Regent Street, London. 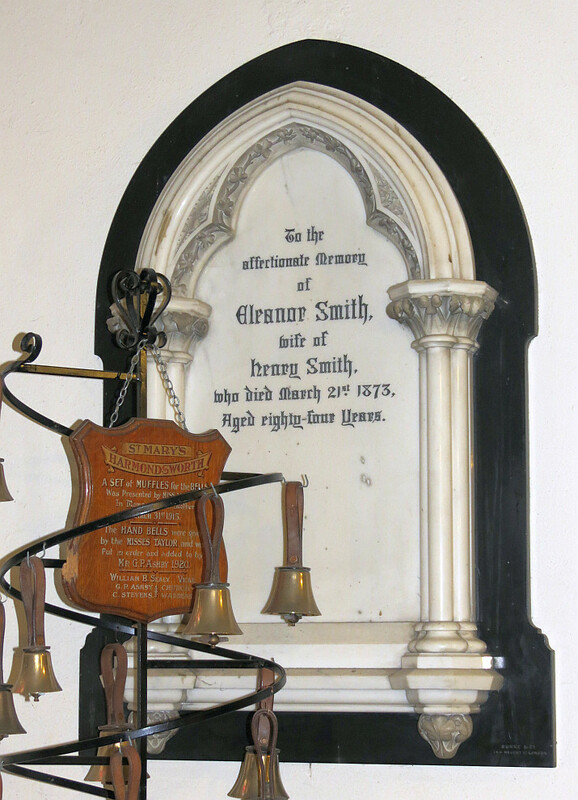 In the first picture above, the items on the left in front of the monument are early 20th Century hand bells. Thomas Tillyer Whipham , d.1917, and wife Florence , d.1893, tablets with inscribed border and crucifix, with outer wooden frame. Unusually for this date, with a Latin inscription. Made by J. Wippell. William Bellett Sealy , d.1924, Vicar, a shaped brass panel in a wooden frame. 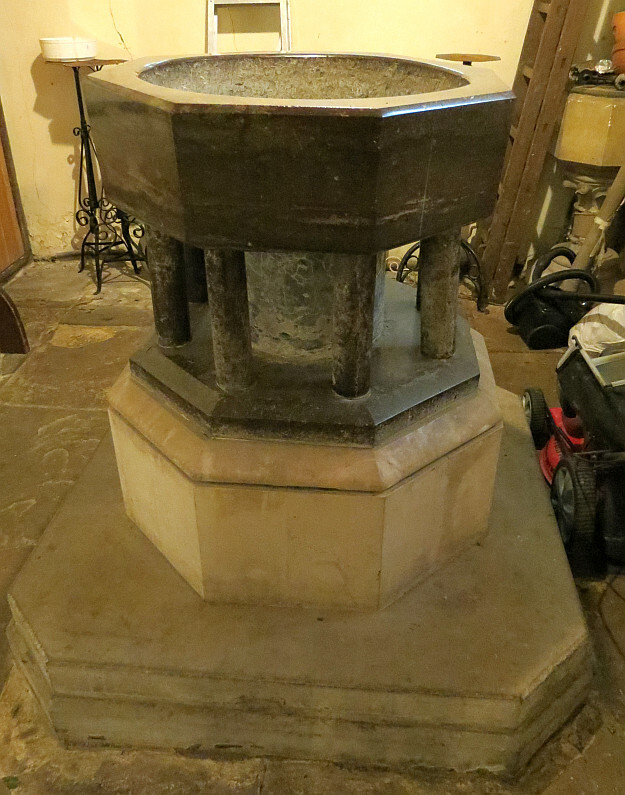 Norman font, as old as the Church itself . 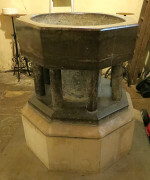 A Norman font , with central column and eight surrounding pillars, all in dark stone, the bowl presumably recarved somewhat, and on a 19th Century base, or later. This really is an excellent piece, and evocative of the massive architecture of the period. 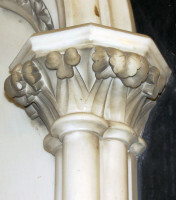 A smaller font, looking 1860ish, in pale stone on a carved central shaft, is tucked away in a corner. Among the various ledger stones on the floor, are several with coats of arms, including one to Richard Combes , d.1672, and his ancestors. Two small wooden figures of praying angels , one pictured below. A cork model of the Church , later 19th Century, helpful in understanding how the different elements of the Church fit together. 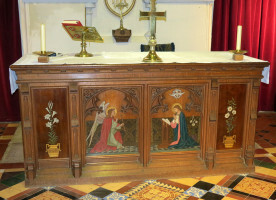 Angel (one of a pair), altar table, and WWI memorial shield . Altar table in wood , with four painted panels on the front: angel and Virgin in the central ones, flowers in Greek pots on the outer ones. This, and the nice tiled floor, also somewhat in the manner of William Burges, are Victorian, and as ever, done with excellence. 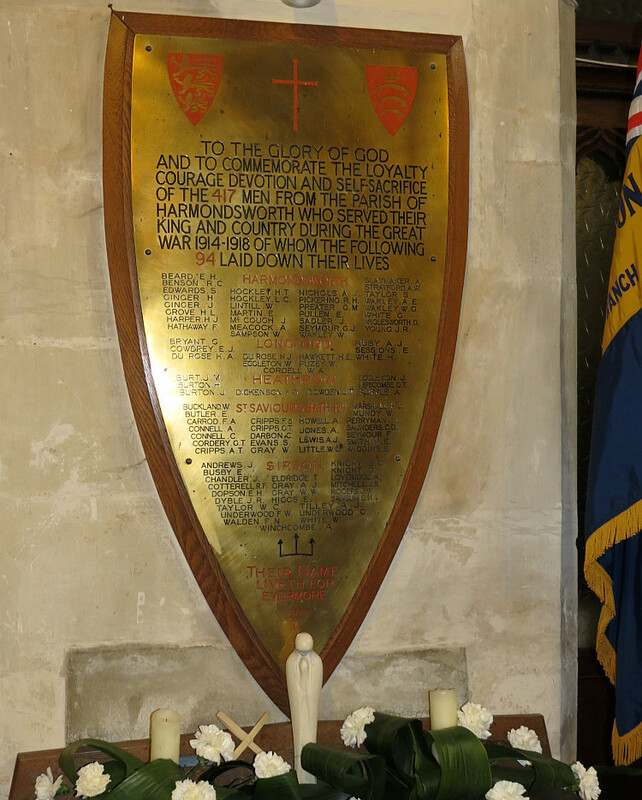 Harmondsworth war memorial , as a brass panel in the shape of a shield, to the men of Harmondsworth who fought and died in World War I. With red highlights in the conventional manner. A few good stained glass windows , of which I particularly liked one composed entirely of repeating clusters of oak leaves and acorns (see picture at top of page, far right). Also windows to James Tillyer, d.1861, and his wife Elizabeth, d.1827, whose monument we saw, rather sentimental religious figures, but with fine female faces, and two kneeling girls of Pre-Raphaelite winsomeness. 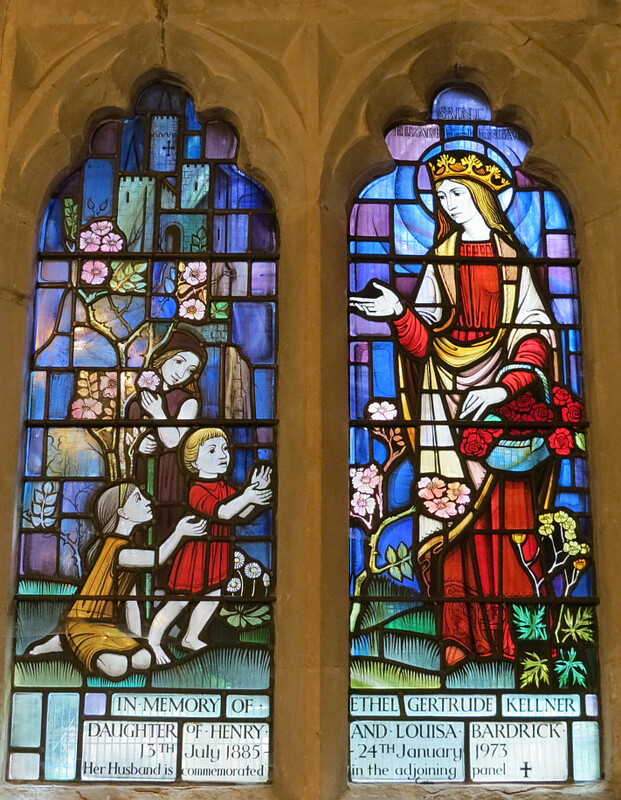 Other glass includes a pair of panels in memory of Gertrude Kellner, d.1973, with a charming group of children around a rose bush, and her husband Louis Hugo Kellner, d.1967, with equally charming tree with hawk, pigeon, dove and at the base, a deer and squirrel, as well as figures. 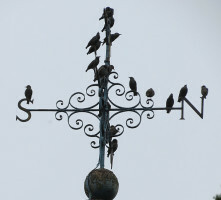 Finally, mention must be made of the Ann & Bryan Sobey window, of the Harmondsworth & Sipson Residents Association, very modern, with the motto ‘Apathy is the enemy of the People’, perhaps referring to the threat of Heathrow expansion to the community. 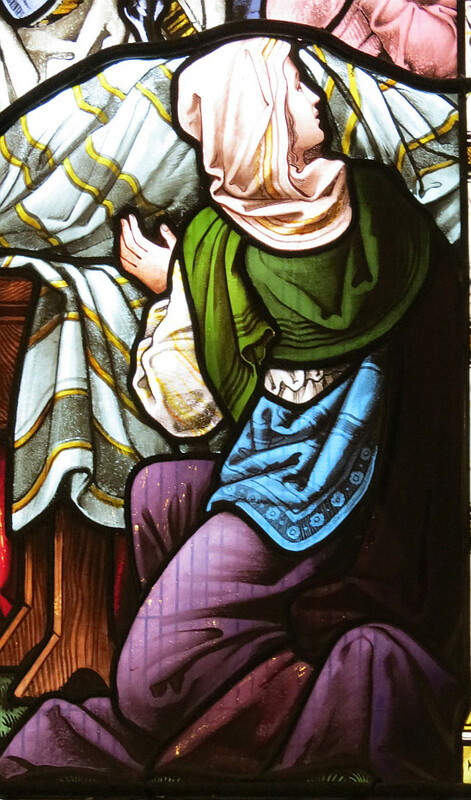 Sample stained glass panels from St Mary Harmondsworth . 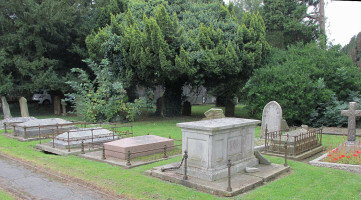 Outside, the Churchyard contains examples of several of the main types of churchyard monument, including several raised ledger stones and chest tombs, among with are a few with their iron railings intact, but these are of architectural rather than sculptural interest. 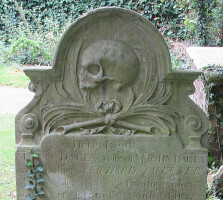 However, we may note that among the gravestones are two or three with skulls carved in relief as memento mori, including a profile skull with crossed branches underneath, to Ann Dauly. 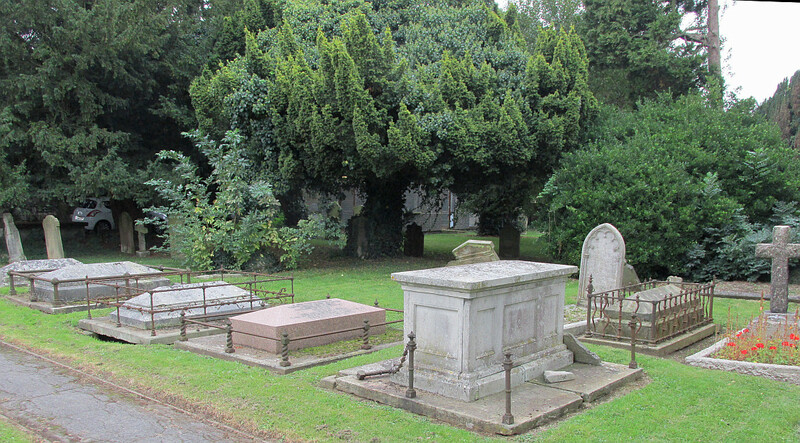 View of Churchyard, a chest tomb with iron railings, and Dauly monument with skull . 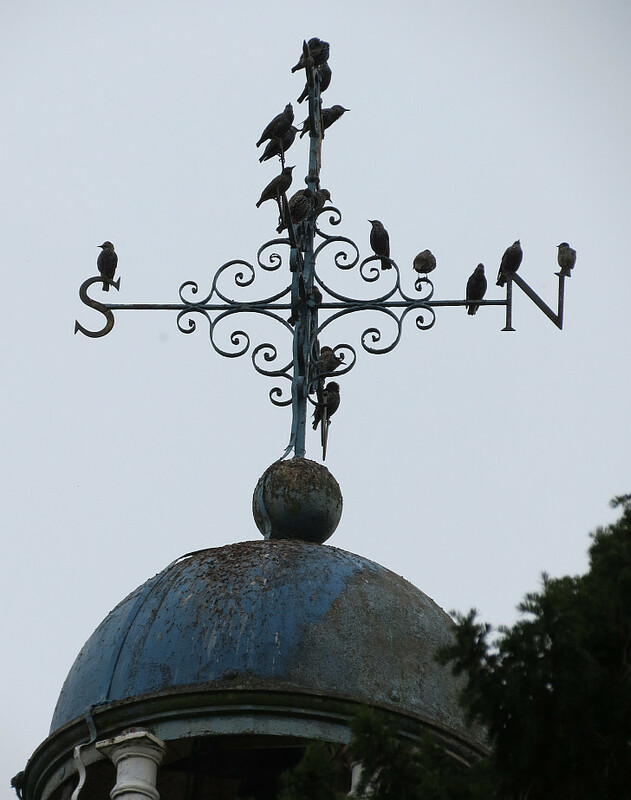 Close to the Church is a 14th or 15th Century barn among a group of interesting agricultural or industrial buildings. 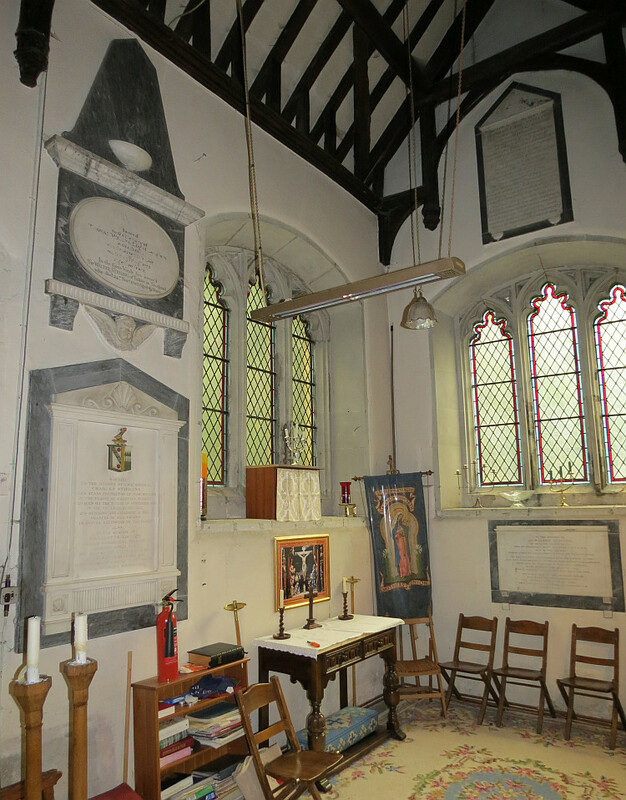 With many thanks to the Church authorities for permission to show pictures of the monuments inside; their website is http://stmaryharmondsworth.webs.com/history.htm.